With precious little fundamental news on the economic calendar and with a national holiday in both the UK and Japan trading volumes are once again very thin, with many currency pairs trading aimlessly in a right ranges of which the euro vs dollar is one. This will probably be in contrast to later in the week when we have a raft of data including interest rate decisions both in Europe and the UK, ADP figures in the US and finally NFP on Friday so hopefully we should see some life return to the currency markets. From a technical perspective the euro vs dollar is struggling to break the 1.335 region and we have now had four consecutive attempts to break this price point, all of which have failed to hold on the day resulting in bearish candles with long upper wicks, and it is therefore not unreasonable to expect the pair to fall in due course and move back below all three moving averages once again. 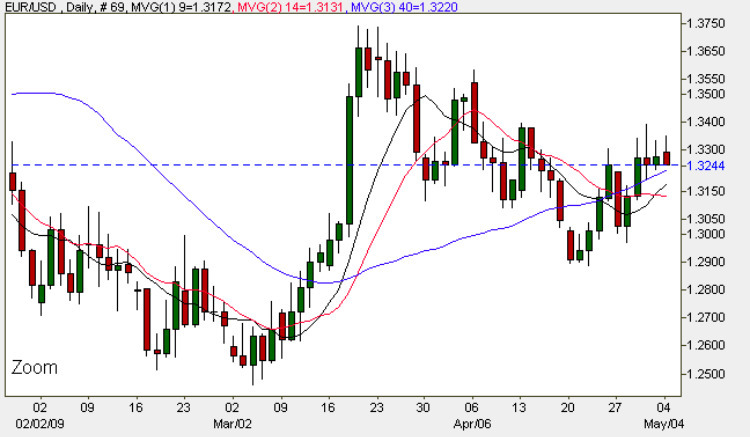 Indeed should this occur we may see a re-test of the support level currently in place at 1.29. 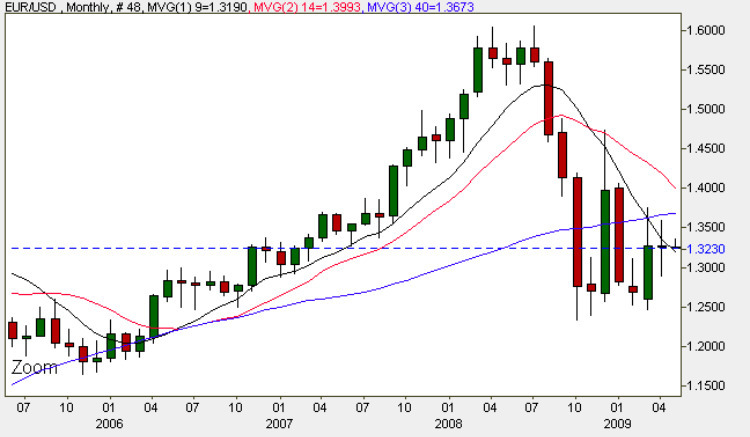 The monthly chart would tend to re-inforce this view closing with a long legged doji symptomatic of market indecision and a possible turning point on the previous month’s wide spread up bar, with the close of the month finishing below all three moving averages. The lesson of the monthly chart is that we may be looking at a period when neither position nor trend trading may be possible and we may be restricted to swing trading on an intra day basis between the 1.25 to 1.35 price range for the next few weeks.